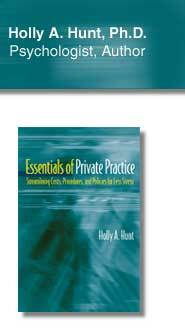 Essentials of Private Practice | Holly A. Hunt, Ph.D.
Holly Hunt has written a highly informative and useful guide to the nuts and bolts of private practice, with an eye to keeping costs low and procedures efficient, thereby maximizing income. It is so full of hints and information that I imagine almost any practitioner will find food for thought and enough useful ideas to justify a reading. It provides ample, practical, on-target information delivered with a friendly attitude. And, speaking of keeping costs low, it’s a good value at a list price of under twenty dollars. Dr. Hunt provides methods of organizing the day-to-day aspects of a clinical practice which prevents therapist stress and allows for greater utilization of time and energy. Reflecting on this part of her book, I found extremely useful tips and suggestions that I only wish I had known from the beginning of establishing a private practice. Streamlining, making it simple, organization, getting paid, and doing good business as a therapist with less stress is the focus of Dr. Hunt’s book. This book is highly recommended for beginning and experienced therapists alike. This book offers a concise, yet rich, portrait of ways to improve your practice and make it the most profitable business it can be. It has motivated me to take a second and third look at my office practices to build up my “bottom line”. Dr. Hunt walks you through the tools you need in order to build an ethical, caring, and effective profitable practice. This well organized and detailed book is a practical resource with a range of strategies for dealing with the business of private practice. This book provides the reader with information, ideas, tools and strategies needed to enable the practitioner to evolve and thrive under a variety of circumstances.